If you’re thinking about selling antique jewelry and don’t want to receive an unfair price from your local pawn shop, you have come to the right place! Here, at NYCBullion, we ensure that selling old gold jewelry or any precious old jewelry is a simple and delightful experience. Among many antique jewelry buyers, we are one of the few that guarantee you will receive a high-class assessment of your precious old jewelry in no time. Selling jewelry with NYCBullion is always a pleasure and you can be confident your antique assets are in good hands. We know the true value of an antique piece of jewelry and you can be sure that if you own one, you will receive the best customer service when you decide to sell antique jewelry to us. So stop by at our store in NYC to get an incredible cash payout for your outstanding antique jewelry. Looking for where to sell antique jewelry? You can be confident that you’ve found the best place. With NYC Bullion, we make sure that you receive a fantastic cash for jewelry offer if you decide to sell your precious antique assets to us. Each antique item is thoroughly appraised by our top-notch professional team of jewelry experts right in front of you, so you get the most transparent assessment of your precious jewelry. Our gemologists with years of expertise will happily assist you with any question regarding the authenticity of your antique jewelry. Don’t hesitate anymore, visit us in the Diamond District and get your free appraisal and superb cash payout for your antique jewelry today! How to Sell Antique Jewelry? Wondering how to sell your antique jewelry? We, NYC Bullion, offer you two great ways to accomplish that! Whether you decide to sell your antique jewelry online or in store, we guarantee that you will receive the best customer service in town. If you would like to get quoted by e-mail, all you have to do is to complete the “Get an offer now” form online and you’ll receive your personal appraisal in no time. If you go with a face to face experience, however, you won’t regret it. Stop by our store in the Diamond District and our high-class certified gemologists and jewelers will authenticate your antique jewelry in the most transparent way – right in front of you. Thus, when you decide to sell your antique jewelry, you will be completely confident that you know everything about it. Whether online or in store, contact us and we will ensure that you will receive a generous and fair cash for jewelry payout for your antique assets. Sometimes, customers get confused whether they own antique jewelry or estate jewelry. To clarify the distinction between these two terms, you should know what kind of jewelry is called antique and what is referred to as estate. 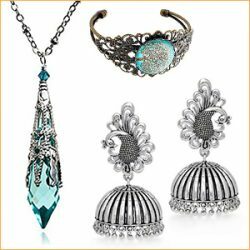 Antique jewelry is the jewelry items that are more than 70 years old, although officially, it’s considered that antique jewelry must be over 100 years old. On the other hand, when we speak about estate jewelry, we refer to pre-owned or “used” jewelry, which refers to jewelry that was previously worn by somebody. Here, at NYC Bullion, we accept both estate and antique jewelry for free appraisals.